It is amazing how many people share the same experience. When they try talking to their doctors about using vitamin and mineral supplements, they are met with condescension, laughter or belittlement. These are the same doctors mind you, that when working with a woman who has just become pregnant, insist that they take a prenatal multivitamin/mineral supplement for the health of their baby. Fortunately people are educating themselves on the value of a good quality multi-vitamin/mineral supplement because they have access to the thousands of peer-reviewed studies published every year validating the use of vitamin and mineral supplements in the prevention and treatment of disease. Despite the media frenzied attempt to discredit nutritional supplements, the latest government-sponsored survey, found that more than half of American adults take nutritional supplements and more than three-quarters of U.S. Physicians (79 percent) and nurses (82 percent) recommend dietary supplements to their patients, and a similar number – 72 percent of physicians and 89 percent of nurses – personally use dietary supplements regularly, occasionally or seasonally. “The increase in supplement use may be due to increased awareness and education about dietary supplement use,” said lead report author Jaime Gahche, an associate service fellow in the CDC’s National Health and Nutrition Examination Survey/Planning Branch at the National Center for Health Statistics. The reason for the growing popularity of nutritional supplements is both simple and complex. The fast pace of our society makes it difficult to make the best nutritional choices in the foods we eat. As a result, nutritional deficiencies are prevalent in our world today. Reverse The Trend – Add 10 Years (Plus Quality) To Your Life! According to a recent study conducted at the National Institutes of Health, researchers examined end segments on the DNA strands of over 580 women. These segments, called telomeres, shorten a little each time a cell divides. Shorter telomeres have been linked with an increased risk of serious health issues and death. Clinical studies have found that other nutrients and lifestyle habits help preserve telomere length as well, such as vitamin D, resveratrol, exercise and calorie restriction. This study provides yet another good reason to take a high-quality multivitamin on a daily basis – something too many people brush off as unnecessary. Bruce Ames, PhD, one of America’s best-known and most-respected scientists, believes a daily multivitamin and mineral supplement could be your best protection against age-related disease. He postulates in his “triage theory” that when micronutrients are in short supply, the body allocates scarce resources to activities necessary for short-term survival, such as energy production, blood circulation, and brain function. This leaves other, less vital processes—DNA and mitochondrial repair, for example—to bear the brunt of the deficiencies. Over time, Dr. Ames maintains, cumulative damage and disruptions in metabolism lead to diseases of aging. Let’s face it – most of us do not take a personal inventory of what we eat on a regular basis to ensure proper nutrition. Even if we are diligent, much of the nutrition in the foods we eat today have been stripped of their nutritional value by over processing. Nutritional supplements are more widely used today than at any other time in our history. People are using nutritional supplements to fill the gaps between our unhealthy diets and our body’s needs, helping to enhance everything from our workout regimens as well as our memory and mental functions. The lack of proper supplementation may not be apparent; your body is amazingly equipped to keep you in balance, even when you are not providing the proper amounts of nutrients. This takes its toll on our bodies. Our bodies, unlike cars, have no body shops to change our oil, perform tune-ups or rotate our tires. Our bodies rely upon the nutrients we take in to allow it to self-perform these regular life essential tune-ups. If these nutrients are not provided to our bodies, the next step is a trip to the hospital, taking pharmaceutical drugs, which if you took them when you were well would make you sick. We can help avoid such human body shops with proper nutritional supplementation. You have the power to not only support longevity through supplementation but also improve the quality of your life along the way. You have a choice not to suffer from premature aging, fatigue, weakness, insomnia, irritability, nervousness, depression, poor concentration, memory loss, aches and pains, recurrent infections, allergies, circulatory problems and just not feeling at your best. Do you take a high-potency daily multivitamin/mineral? Don’t wait any longer; take control of your health with proper supplementation! 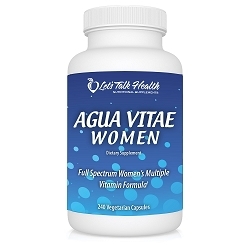 You may not know this, but our best-selling multivitamin, mineral and antioxidant formula, Agua Vitae, has been sold in the Scandinavian countries under a different name, and has won nutritional supplement of the year for 5 consecutive years! 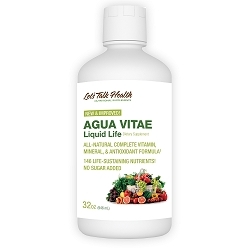 This award-winning formula contains146 life-sustaining nutrients including an anti-aging antioxidant complex, amino acid complex, exotic fruit antioxidant complex, an herbal and mineral complex as well as full spectrum blend of essential vitamins and omega fatty acids.